​ At the forefront of our research efforts is the development of synthetic analogs of membrane transport proteins (MPs) and their use in completely synthetic environments to design high performance and scalable membrane materials. 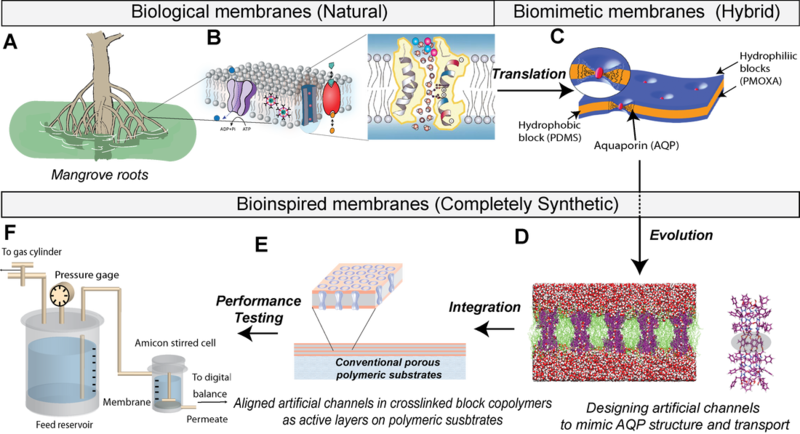 The Figure below briefly delineates Kumar’s research path from being inspired by biological membranes, such as those present in mangrove roots and in our kidney, to working on hybrid biological-synthetic biomimetic membranes during his PhD, and finally to the Kumar group's current work in the area of bioinspired membranes. Kumar has been involved in studying AQPs, biological membranes and their transport mechanisms and their integration into synthetic membranes since his PhD. His work was the first to demonstrate that the function of AQPs remain intact in polymeric membranes and predicted that these membranes could be orders of magnitude more permeable than current membranes. This work remains an important reference for recent research and industrial development activities on using AQPs for water purification. We have worked with two start–up companies in efforts to commercialize this technology and a current product is now on the market. At Penn State my group has pursued research into artificial water channels as a promising and unexplored area of research. We have expanded our expertise in organic synthesis of channels and of block copolymer (BCPs) through several important collaborations. We have been able to independently synthesize a library of BCPs and artificial channels at the several gram scale. We have also developed the capability to conduct molecular simulations through collaborations and can independently conduct simulations on proteins, lipids and BCPs. Our work on single channel characterization of MPs is already well cited and forms the basis of artificial channel characterization currently utilized in characterization of artificial channels. An important distinction to draw is the fundamental difference of transport mechanism between using channels (both biological and artificial) compared to current solution-diffusion membranes used for solute separations. Solution-diffusion membranes are those where components of the solution first dissolve into the membrane matrix and then diffuse across the membrane by “jumping” between transiently connected pores leading to an inherently lower energy efficiency. Specific examples of such membranes include NF and RO membranes and dense polymeric gas separations membranes. In recent years there has been an increasing focus on ideas inspired by nature to find an alternative paradigm for conducting efficient molecular separations and have focussed on biological channels. Channels provide a straight-through pore for diffusion of molecules over shorter path lengths in channel-based membranes. Although RO desalination of seawater using solution-diffusion membranes has reached close to (within approximately 2X) the thermodynamic minimum energy needed for such separations, most membranes used for brackish water treatment and water reuse applications are still far from this limit15 and large reductions in footprint reduction (~45%) are still possible for seawater desalination. Footprint reduction and water reuse are both relevant in coastal urban centers that are densely populated.Thus synthesizing more efficient solute separation membranes is an important research endeavor. The proposed work is a new direction in our group and in the field of membranes for water treatment as summarized in the Figure below. While the hybrid biomimetic system that we have developed incorporating AQPs into BCPs is an excellent model system, there are challenges to scale up and the long-term stability of AQPs in real systems is a major concern. We are working on a completely synthetic system where the channels used for synthesizing membranes are not biological but made using synthetic chemistry. Our experience with AQP structure and function informs the design of a series of these artificial channels. These channels are then cast into lamellar (layered) block co-polymer films or into packed sheets and deposited on porous substrates to synthesize composite membranes. Structure function properties for this new class of membrane are conducted using advanced imaging and transport characterization techniques.